In a boat you are very exposed to the weather; the cold, wind and rain can combine to give you a thoroughly miserable time if your clothing is not up to the job. I bought my Minus Ten in 2002 and after a couple of winters I am delighted with it. I really can't think of anything to criticise about it, it is waterproof and it is warm, the hood is also a proper fit and fastens up nicely to keep the wind and rain out. I have managed to snag it a few times with lure hooks, but so far none of these minor perforations appear to letting any water in. It is far too warm for bank fishing and walking about, or launching the boat, it goes on just before I get in the boat. I came up with a rough rule to suit me, if the temperature forecast is for less than 9°C I can wear the bib and brace without overheating, and the wind chill will decide if I need the coat or not. You don't need much underneath the suit, the 'Sleepskin' long-johns I've never worn, jeans alone are fine, a T-shirt and the 'Sleepskin' hooded sweatshirt are all I need on the top half. In that clothing I've been out in temperatures as low as 2°C, with a fresh northerly breeze and stayed warm all day, (with thermal boots of course). There is plenty of technical information on the Sundridge website, which is where the photo came from. 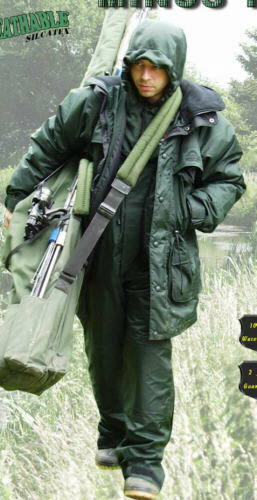 I bought mine from a local tackle shop, it's in XL size, which is comfortable for me although for most clothing I'm M/L, so best to try it on before you buy.